Looking for Govt Jobs in J&K in 2019-20? J&K Govt approved 2000 Accounts Assistant Posts on Direct Recruitment basis. A Big news is coming on 1st March, 2019, as SAC which meant under the Chairmanship of Governor Shri Satya Pal Malik has given approval for creation of 2000 Accounts Assistant Posts in Panchayati Raj Department. These posts were First mentioned in the Budget Document of J&K in Dec, 2019. Now the Govt has given approval for creation of these posts. 4) Recruitment will be done on District cadre basis. 2018, remained a Dry year for those seeking Govt Jobs in J&K. It is the for the First time in the Last 8 years, that JKSSB announced minimal No. of Jobs in a Calendar year. You will be surprised to Know that only 213 Govt Jobs have been announced by JKSSB in 2018, which is the lowest in the Last 10 years, as Every year JKSSB announced 1000's of Posts. In fact, in 2017, JKSSB has announced Six Advertisements with Overall 5000+ Posts. Even more Shocking is that JKPSC has announced more Jobs than JKSSB in 2018. which means, More Gazetted Jobs announced in 2018 than Non-Gazetted posts. Now, this Dry spell will end in 2019, as JKSSB will announce at least 10000 Govt Jobs in 2019-20 and out of which there will be 2000 Accounts Assistant Posts at village Level for Panchayati Level Institutions. For more details, on Upcoming JKSSB Jobs in 2019-20, you can read our previous post on JKSSB Recruitment 2019. 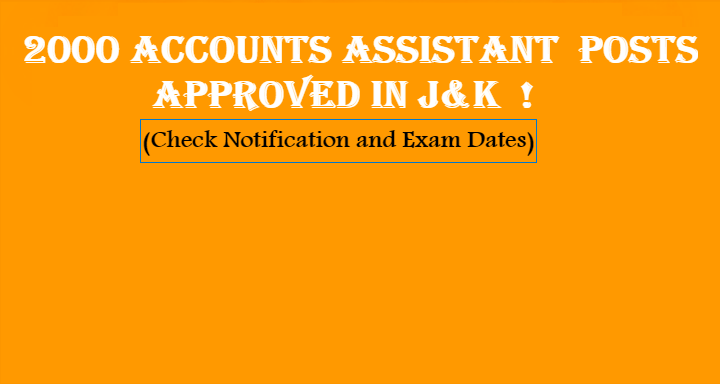 In this post, we will discuss regarding the 2000 Accounts Assistant Posts that have been approved in the recently announced J&K State Budget 2019-20. Job Seekers of J&K, its raining Government Jobs. 2018 was a tough year, when vacancy count was too low and 2019 seems to cover the vacuum by announcing Bumper Government Jobs on daily basis. 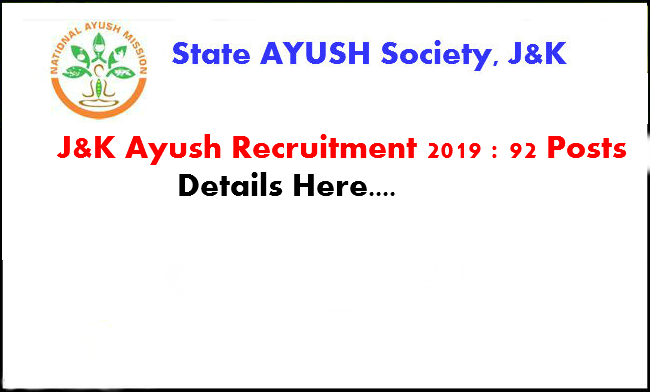 Only yesterday, we have shared the Information regarding the AYUSH Recruitment 2019 for 92 Posts and Today, we will be sharing Recruitment Notification for various posts in the J&K Legislative Assembly. It is for the First time after so many years, that J&K Legislative assembly has invited applications for various posts. Earlier in 2018, Legislative council (J&K Secretariat) has invited applications for some posts. So don't get confused with Legislative Assembly and Legislative Council. Both are different wings of State Legislature. This Recruitment is announced for J&K Legislative Assembly. A Total of 28 various posts have been announced by J&K Legislative Assembly. Though the No. of posts is not very Big, but it is still an awesome opportunity for those having Qualification of 8th, 10th and 12th. 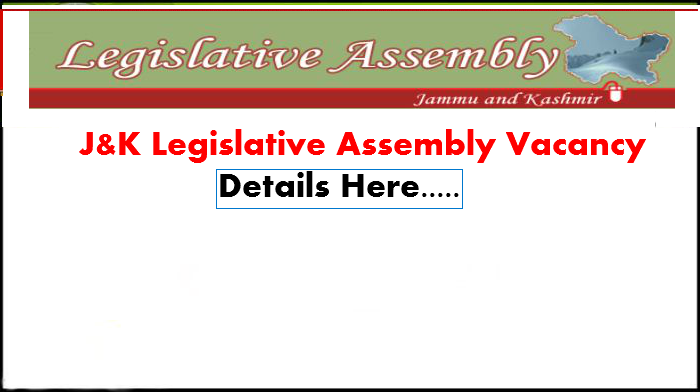 In this post, we will discuss the complete details of J&K Legislative Assembly Recruitment 2019. Applicants willing to apply for these jobs, should read this post till the end and also submit their application forms before the closing date ie 22nd March, 2019. If you are from Jammu and Kashmir, then you might be aware of the fact that some Bumper Recruitments have been announced by State Govt Departments and Recruitment agencies. The biggest creator of Jobs in 2019 is Health and Medical Education Department of J&K, where 750 Contractual posts announced in 5 New Medical Colleges and at the same time, 1200 Permanent posts announced by JKSSB is these Medical colleges. So, all in all its Raining Govt Jobs in J&K. Today, there is another Bumper Recruitment announced by State Ayush Society, National AYUSH Mission, J&K. Though the posts are contractual is nature, but Notification clearly mentions that further extension will be given in case of good performance by Mission Director NAM. Moreover, candidates with poor performance their services will be terminates by giving them One months Notice. A Total of 92 various posts have been announced for J&K AYUSH Recruitment 2019. Applicants willing to apply for these posts in AYUSH J&K should read this post till the end and submit their application form before the closing date. On 25th Feb, 2019, JKSSB has announced the Final Selection List for 2154 Teacher posts announced in Dec, 2017. It took almost 14 months for JKSSB to complete the Selection process, though at the time of advertising the posts, these were said to be Fast Track Recruitment to be completed in Six Months. However JKSSB has cited various reasons that lead to Delay in announcing the Selection Lists, but the Good news is that Lists have now been announced, and 2154 candidates are selected as Teachers in Districts of J&K. Apart from this around 1000 candidates have been placed in the Waiting Lists. Now the Results have been announced. Though 2154 candidates have made it to the Final List. Yet there are Thousands of candidates who despite strenuous efforts, could not make it to the Final List. To all those candidates, i will say. Please don't lose hope, this is the time for Introspection, Find what mistakes you have made and Attempt the Next Exam with Doubled Effort. Hope that Next time, you will find your Name in the Selection List. And we are here to help you with all the Data that you need for the Upcoming Teacher Exam. Yes, in this post, we will discuss the JKSSB Teacher Cut off, so that you will know, How much marks you need to Pass the Teacher Exam. Though the cut off varies Exam to Exam, but still it will give you a rough idea, How much marks you needed to pass the upcoming exam.